HPV is one of the causes of cervical cancer. Gardasil offers preventative protection against HPV infection, but not all high-risk young women understand the benefits of the vaccination. 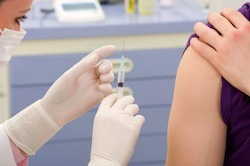 Researchers from the London School of Hygiene and Tropical Medicine recently investigated public view of the HPV vaccine in an attempt to conclude why some populations are unwilling to be vaccinated. This study was completed via questionnaire in Tanzania. A total of 404 interviews were conducted with 159 active participants and 245 controls. Both students and adults were interviewed. Adults: Adults who did not support the HPV vaccine typically did not go to the school meeting on the vaccine. They also rarely knew someone with cancer. Students: Students were tainted by dislike for the school worming program, lack of knowledge about the human body and fear of infertility. Conclusion: When adults and students were educated about the HPV vaccine, including being given information about cervical cancer and fertility. Researchers noted that adults said they would reconsider the choice to skip the vaccine in 97% of cases. Students said they would be vaccinated if given a second chance in 93% of cases. Source: Watson-Jones D, Tomlin K, Remes P, Baisley K, Ponsiano R, Soteli S, de Sanjosé S, Changalucha J, Kapiga S, Hayes RJ. Reasons for Receiving or Not Receiving HPV Vaccination in Primary Schoolgirls in Tanzania: A Case Control Study. PLoS One. 2012;7(10):e45231. doi: 10.1371/journal.pone.0045231. Epub 2012 Oct 24.